I have performed with numerous high school and college/university jazz ensembles, and I am always happy to visit your school. I have a variety of jazz ensemble charts I like to use for these occasions, and I'm also happy to play on whatever your band is working on. I visit schools whenever I can to offer clinics and master classes on a wide range of topics. 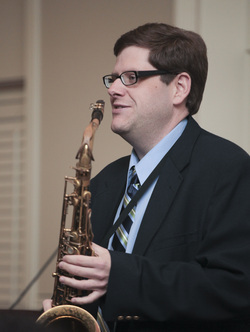 I can work with your saxophone students or your jazz ensembles, and I always try to be personable and fun, while working hard to improve your students' playing. I am available to serve as an adjudicator for your jazz festival or contest. I aim to provide constructive criticism in as encouraging a manner as possible. If you are planning an event in the Greenville-Spartanburg/Upstate South Carolina area and are considering live jazz for your event, I will provide you with the finest musicians in the area. I offer jazz ensembles from 1-4 musicians for your wedding, corporate event, dinner or cocktail party, and more. Contact me using this form to inquire about my group's availability for your event and to get more information. Thank you for considering live music for your event!